Polymer-derived ceramics (PDCs) with high temperature stability under harsh environmental conditions are important for the development of unconventional ceramic compositions with new functional properties. We design preceramic polymer precursors and explore systematically the functional properties in materials derived therefrom. 1. Visible light photocatalysis with c-WO3-x/WO3xH2O nanoheterostructures in situ formed in mesoporous polycarbosilane-siloxane polymer. J. Am. Chem. Soc. 2013, 135, 4467-4475. 2. 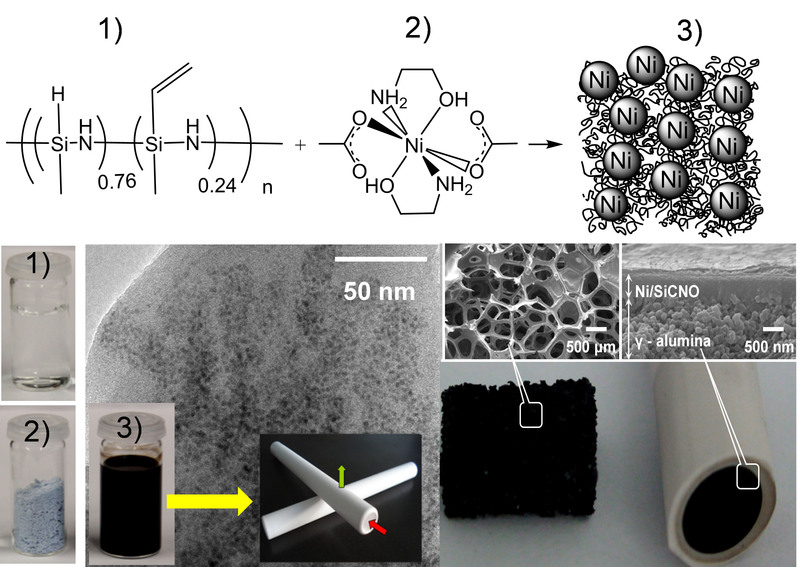 In situ formation of tungsten oxycarbide, tungsten carbide and tungsten nitride nanoparticles in micro- and mesoporous polymer-derived ceramics. J. Mater. Chem. A 2014, 2, 10454-10464. 3. High-temperature stability and saturation magnetization of superparamagnetic nickel nanoparticles in microporous polysilazane-derived ceramics and their gas permeation properties. ACS Appl. Mater. Inter. 2014, 6, 12270-12278. 4. Microporous ceramic coated SnO2 sensors for hydrogen and carbon monoxide sensing in harsh reducing conditions. Sensor. Actuat. B-Chem. 2010, 149, 105-109.